CRISPR-Cas9 allows researchers to make very precise cuts in DNA. 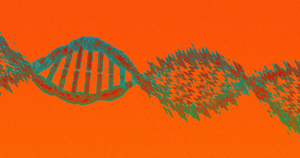 But precise cuts aren’t always needed, because sometimes it makes more sense to splice up an entire sequence of DNA — and now researchers have a CRISPR tool that can do just that. It’s like a “DNA shredder with a motor,” she added. In a study published on Monday in the journal Molecular Cell, Zhang and her colleagues describe how they were able to use Type I CRISPR-Cas3 to “shred” segments of DNA 300 to 100,000 base pairs long in human embryotic stem cells and HAP1 cells. The experiment marked the first time anyone had used this CRISPR tool in human cells, and the researchers see a number of potential future applications. For one, scientists could use Type I CRISPR-Cas3 to shred long sequences of non-coding DNA — DNA that doesn’t provide instructions for making proteins and the function of which is often unknown — to see what happens. This could help them track down large segments of DNA important for specific diseases. They could also remove the shredding function altogether and use Cas3 as a long-range delivery system for epigenetic drugs.